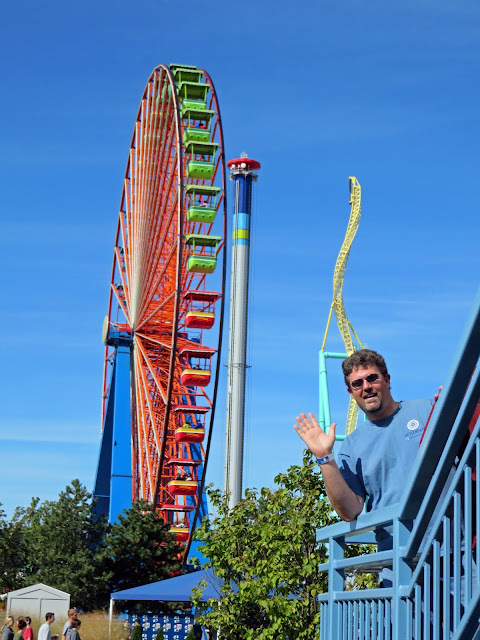 Yesterday Ed and I went to Cedar Point Amusement Park in Sandusky, Ohio. We haven't been to one of these places since 2006. I was hoping to never set foot in one for the rest of my life. In fact, I vowed that last time, was going to be the last time. It wasn't. Cedar Point is known as the Roller Coaster Capital of The World. Among its world-record 72 rides, it has 16 roller coasters. 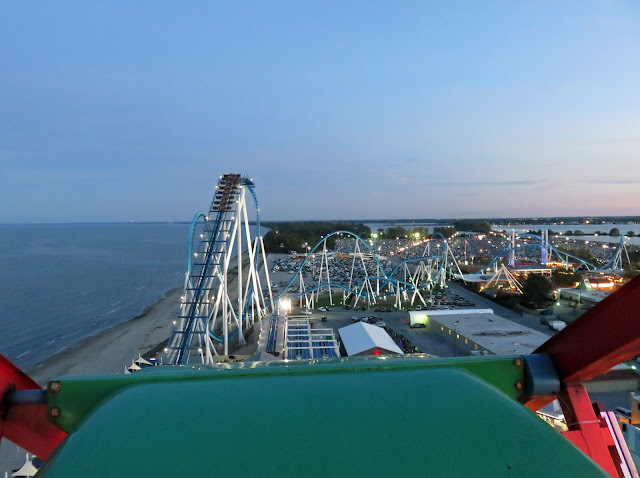 That ties it with Wonderland, located in Canada, for the second-most roller coasters in an amusement park. 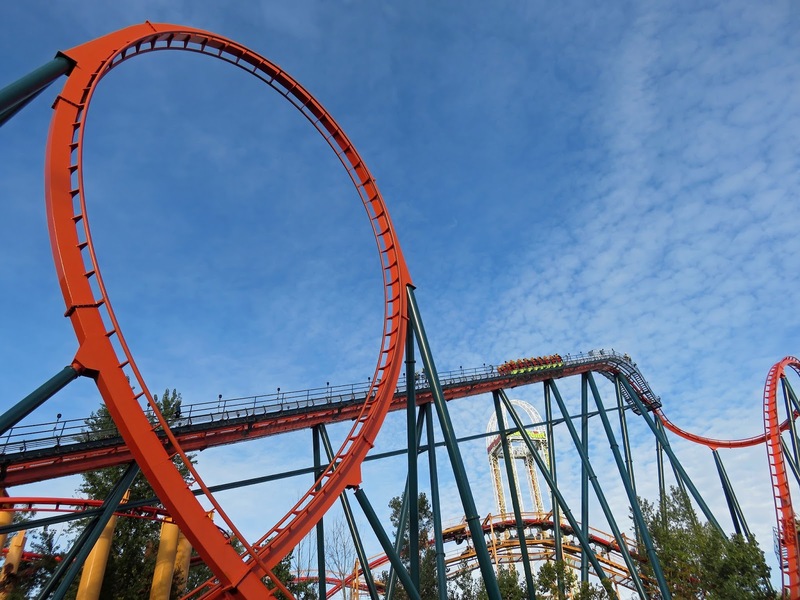 Six Flags Magic Mountain in California boasts 19 roller coasters. Which I guess actually makes them the roller coaster capital of the world...but, ok, whatever. 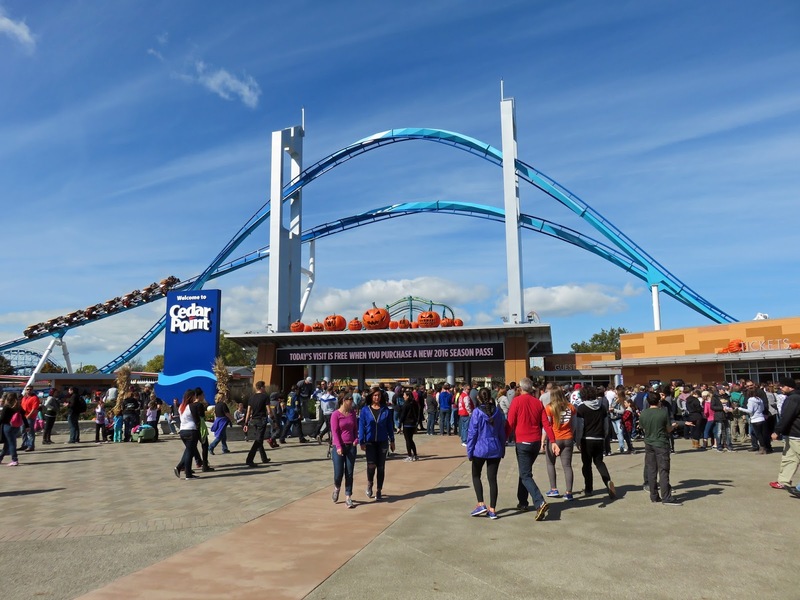 Cedar Point covers 365 acres and sees over 3.3 million visitors each year. 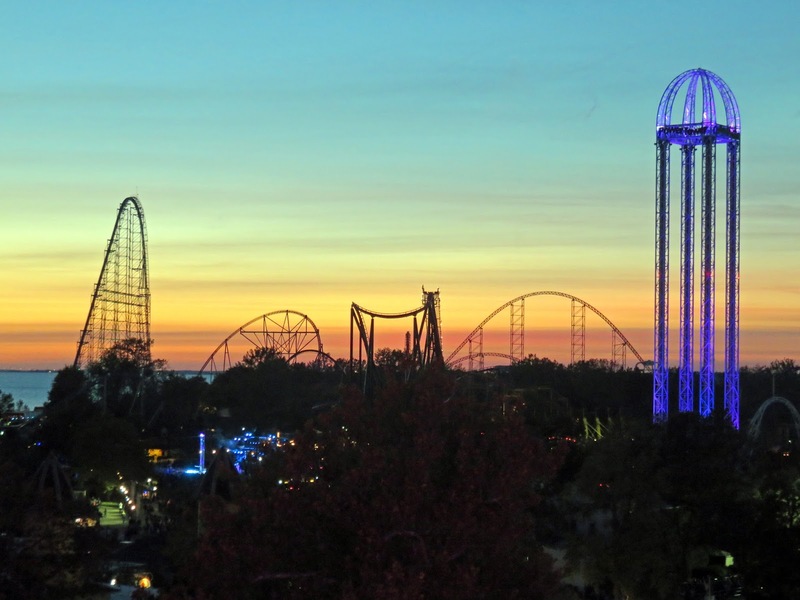 It opened in 1870 and is the second-oldest operating amusement park in the United States. Ed has really been wanting to go to Cedar Point. For years. Like really, really, really, really. Like a five-year-old really wants ice cream. Or a new toy. Or a puppy. Every time we passed through the state of Ohio and got even remotely close to this area, he'd say, "We should go to Cedar Point." And I thought, I'd rather have a root canal. But Ed is a great guy. He's patient and kind and loving. He's thoughtful and generous and even-tempered. He always takes me everywhere I want to go, buys me almost everything I want, and listens (albeit selectively) to the thousands of words I utter on a daily basis. So what's one day at an amusement park? Here is Ed waiting to go on his second coaster of the day, The Gatekeeper. You can see the Giant Wheel, the WindSeeker Swing Ride, and the Wicked Twister in the background. 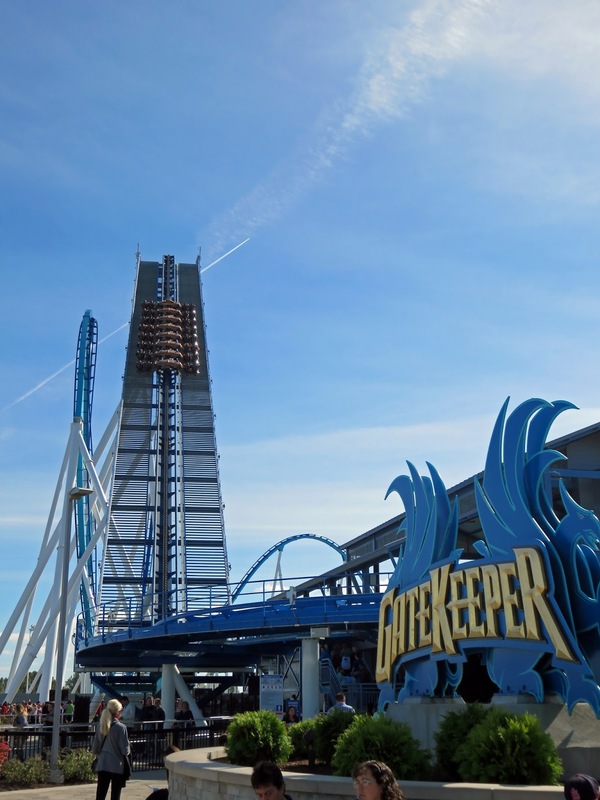 The Gatekeeper is the tallest, fastest, and longest wing roller coaster in the world. It breaks seven world records. The "wing" part refers to the car, which is crafted like a bird with wings. 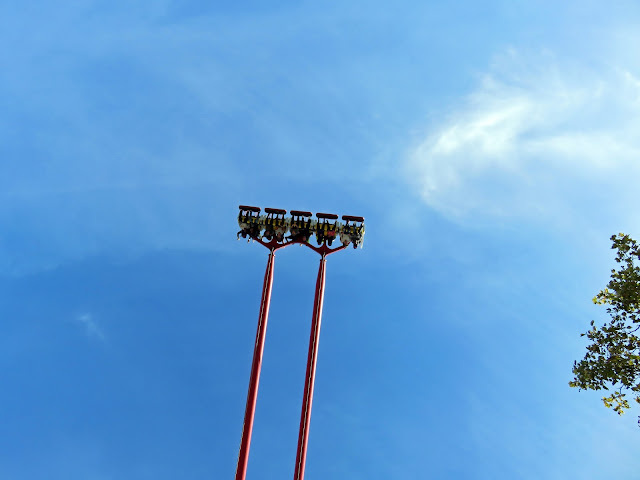 The center of the car rides on the track and the passengers sit on the left and right "wings" that hang over the edge as it flies at 67 mph over 4,164 feet of track. Here it's on the ascent of the first hill. And here at the end of the red arrow, is Ed. When I told him I got his picture as he was going up the hill, he was excited. When I showed it to him he said, "The back of my head?? You got a picture of the back of my head?". Well, it is still him. They rate the rides in the park from 1-5. 1 is Low Thrill, 2 is Mild Thrill, 3 is Moderate Thrill, 4 is High Thrill, and 5 is Aggressive Thrill. Otherwise known as, You May Leave This Ride With A Neck Or Spine Injury If You Are Lucky Enough To Make It To The End. Most of the roller coasters Ed rode were a 5. 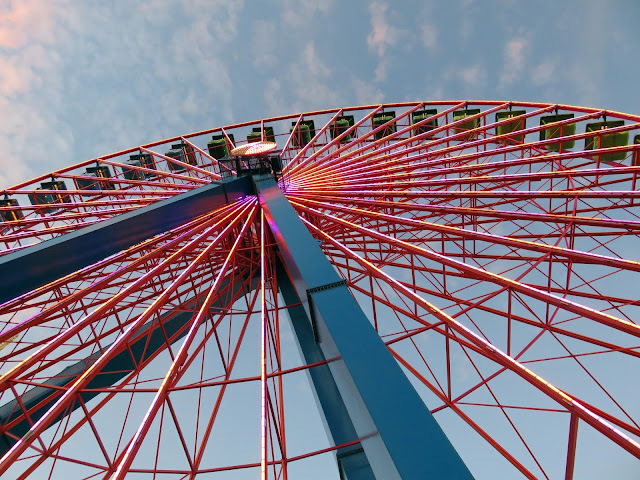 The only things I rode were rated a 1 (Cedar Point & Lake Erie Railroad), and a 2 (The Giant Wheel). That's plenty of thrill for me. 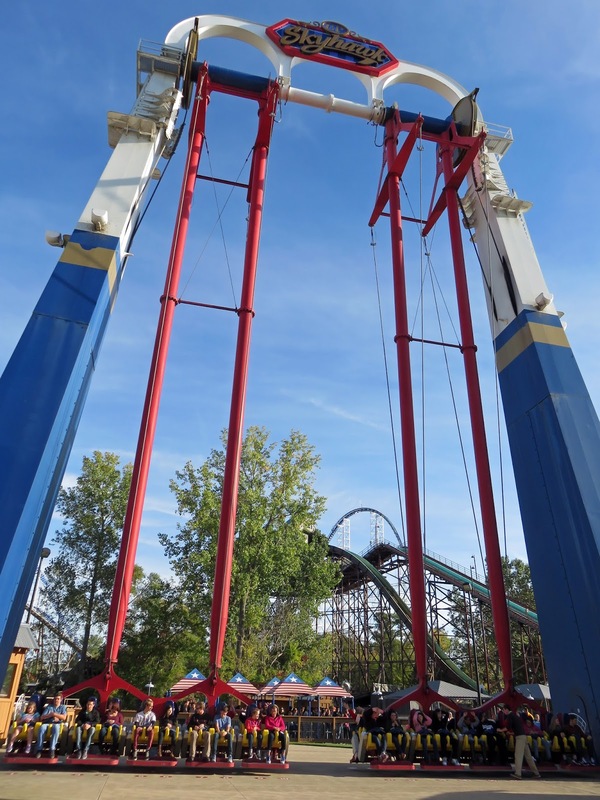 This is The Skyhawk, also rated a 5. Towering 125' into the sky, it's the world's tallest swing ride. The two giant arms swing in a 60 mph scissor motion. The wind from the swinging was so strong, I had to move to another location because believe it or not, I was a little chilly its breeze. Here's Ed, on the upswing. Upside down, high in the air. 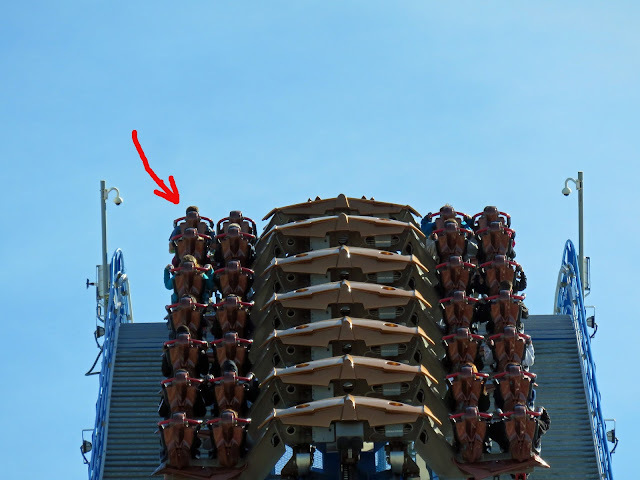 He sat next to a little girl who didn't utter a sound during the ride. He, on the other hand, screamed enough for both of them. I think the little girl was delighted by this because as they were leaving the ride I heard her say to her mom, "That man screamed the whole time..."
The day at the park was insanely expensive. We stood online at one of the food vendors talking to a guy who was there with his five kids. We started talking when he brought up the subject of the high food prices. I was calculating how much everything else must have cost him for the day. It was over $500 just for the two of us. He must have spent a fortune. Granted, we may have bought a few more options than he had, but it's still crazy. We bought everything online and printed the tickets ourselves, so saved a little money there, but it was still pricey. They had truck parking on site, which was super-convenient, and it was only $20. That was the best bargain of the day. We bought two admission tickets, two all-day dining passes, a free-refill souvenir water bottle, two tickets to the animatronic Dinosaurs Alive! exhibit, two Fright Lane admissions to the HalloWeekend frights and delights, and one Fast Lane Plus add-on for Ed. After the first ride, Ed decided the Fast Lane Plus was the best deal of the day. As he rode the rides, he decided he wouldn't have it any other way. He read an online comment about it that said it teaches kids that if you have money you can get things other people don't have. Well, duh. Yesterday Ed was a one percenter. The Fast Lane wristband allows you to bypass the regular lines on certain rides and attractions at the park. The Fast Lane Plus adds four additional rides to your ticket. They only sell a limited number of Fast Lane passes per day, because what sense would it make if everyone were able to bypass the lines? Let me give you an example of what the Fast Lane does for you. There are two lines for certain rides, the regular line and the Fast Lane line. Instead of waiting say, two hours for a ride in the regular line, you might wait 15-20 minutes. At certain rides, there was barely a wait. Ed was able to scoot past everyone in the other line and be ushered right into his seat. After coming off one ride and hearing some other people say, "It was totally worth the two hour wait!" he turned to me and said, "I can't believe people just accept standing in line for two hours." I said, "I can't believe people accept jobs for $8.00 an hour." It really was a perfect analogy of the actual one percent getting better opportunities because they have more money. A Fast Lane Plus pass to life, if you will. It doesn't seem fair, yet it happens. And it's clear why it does. Because if given the choice to stand in line for two hours versus fifteen minutes, over and over again throughout the day, the extra $140 seems worth it. Especially in the summer, in the blistering heat. Without the Fast Lane pass, I don't think it would have been possible for him to ride as much as he did taking into account the 1-2 hour wait times for the rides and the walking distance between them. And, it's October. Imagine what the wait times are in the high season. I didn't ride any roller coasters or rides other than what I said earlier - the train, and the Giant Wheel. Ed joined me on the Ferris wheel at twilight, just after the sun went down. The view was beautiful. 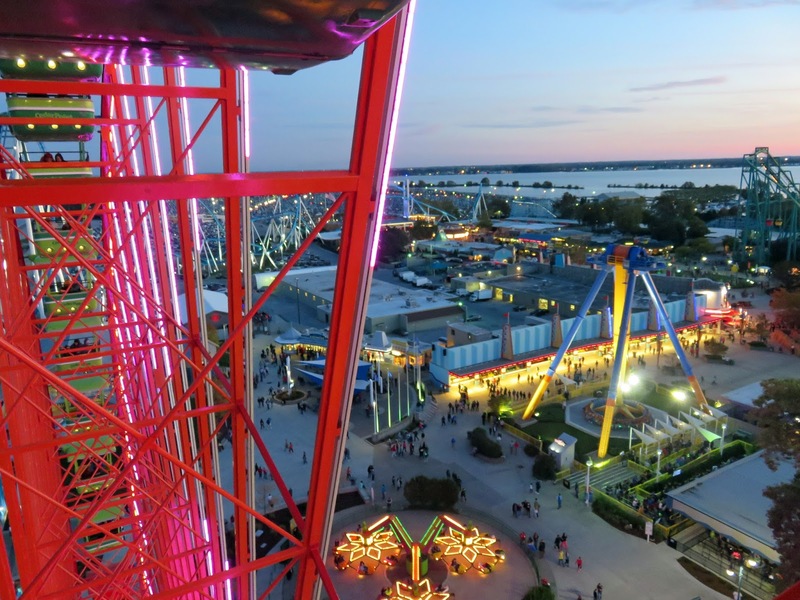 Here's a picture from the top of the Ferris wheel. Lake Erie is to the left, and The Gatekeeper is just in front of us. After nightfall we toured some of the Cedar Point HAUNT attractions - Zombie High School, G.A. Boeckling's Eerie Estate, and Hexed to name a few. For these we both had Fright Lane passes - the spooky equivalent of the Fast Lane pass - with an actual Skeleton Key which gave us "exclusive access" to the Skeleton Key Room at designated attractions. We spent 12 hours at the park. TWELVE. My walking app says I walked 8.19 miles. I felt every step of it. Today I can barely stand up. Ed wanted "a day at Cedar Point" and boy, did he get a day at Cedar Point. An entire day. I'm not a fan of amusement parks. I've never been one for rides, even when I was young. I like water parks and still like water rides, but I'm not a fan of the kids that come along with them. If I never saw another theme park, amusement park, or county fair in my life, I'd be perfectly happy. But because Ed had fun, I had fun. As I waited for him to get off each ride, I told him it was like waiting for someone at the airport. They're happy to see you, you're happy to see them, there's a big hug. I didn't mind the walking, I enjoyed the people watching, and I loved that it was right on the lake. The thing that saved this trip from being utterly miserable for me was the weather. During the day it was in the low seventies and quite warm in the sun, but just a few steps into the shade cooled it off considerably. So much so, that I actually thought it was chilly. By nightfall it was perfect and only got too cold for comfort in the hour after midnight. Overall, it was a really nice experience. The staff was great, the other patrons at the park were friendly, even the teenagers were well-mannered. The "actors" at the haunted houses were really fantastic, and not one single employee had attitude. They seemed to enjoy what they were doing and it showed. I even stopped in at Guest Services on our way out of the park and relayed those thoughts to a manager, telling her it was my first time at the park and I was impressed. She gave me a "1st Visit" button. I'll add it to my pantry door scrapbook collection. And to recuperate, today I'll be taking a 12-hour nap. Great write-up, with beautiful pics, as expected. Good on you for doing all that walking. I've enjoyed my (first ever) annual pass to Kings Dominion this year. Still have to see the Halloween stuff. Ed would love the Intimidator (#5 ride, tribute to Dale Earnhardt) and the Anaconda and a lot of great rides. It's a good day, especially if you go later once the crowds thin and it's cooler. Weirdly, the #5 rides are better on my back than the rickety #2 roller coasters. The bracing and protection helps a lot. Did hear some shorter stature women complaining mightily about neck pain. MAE: Glad you liked tagging along. You enjoyed it and you didn't even have to go on any of the rides!